Despite all of the advances in technology, the bustling lives of city dwellers that get busier and busier, and the movement to homes where both parents work at least one job, there is a growing community of people who are turning to homesteading. 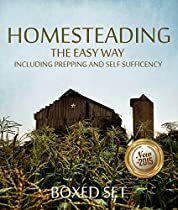 The allure of homesteading can be obvious: it allows you to stay home more, be more self-sufficient, and slow down to enjoy “the simple life.” However, some of the benefits may be more subtle. For example, you have a better diet and spend less money.